Chicken that's been seared, then baked in the oven has a deep brown color and a rich, caramelized flavor, says The Kitchn recipe editor Emma Christensen. Searing -- the process of quickly cooking the outside surface of a cut of meat over high heat -- is typically done on the stove top in a skillet filmed with hot oil, but according to No Recipe Required food writer Dave Beaulieu, you can also use the grill to sear chicken before transferring it to the oven to finish cooking. Take the chicken out of the refrigerator. Allow it to sit at room temperature for up to 30 minutes. Remove the chicken from the marinade, if used, and shake each piece to remove excess liquid. Discard the marinade. Pat the meat dry with paper towels. Sprinkle both sides of the chicken with your choice of seasonings, such as salt and pepper, if desired. Heat a gas or charcoal grill to high. Coat the grate lightly with vegetable oil. Place the chicken on the grill using tongs, positioning the meat skin-side down if the skin is intact. Allow the meat to cook, undisturbed, for one to two minutes. Turn the chicken over when the meat releases easily from the grill grate. Grill for one to two additional minutes on the other side, or until the chicken does not stick to the grate. Put the seared chicken into a roasting pan. Place it into an oven that has been preheated to 400 degrees Fahrenheit. Bake the chicken until an instant-read thermometer inserted into the thickest portion registers 165 degrees Fahrenheit. Allow the chicken to rest for five minutes before serving. If you choose to marinate your chicken before searing and baking it, plan to leave it in the marinade of your choice for approximately two hours before cooking. Always marinate meat in the refrigerator. Do not leave raw chicken sitting at room temperature for longer than 30 minutes. Do not add salt to chicken until just before you place it on the grill to sear. Presalting the meat can cause the chicken to lose moisture. If you choose to sear-roast your chicken with the skin intact, remove it before eating to keep your fat and cholesterol intake low. 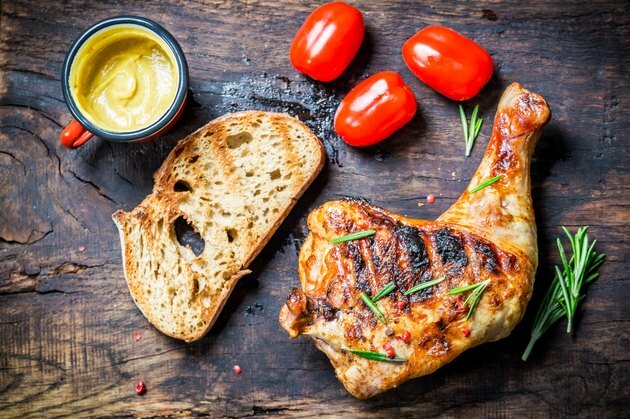 What Are the Steps to Grilling a Chicken if Using a Conventional Oven?